Office 365 University, office for students. Get installed applications plus online storage and more. For eligible students, faculty or staff at Universities and colleges. Create your best work. 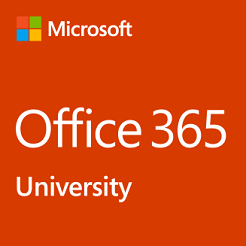 With Office 365 University, you get Word, Excel, PowerPoint, Outlook and more. Work anywhere with apps that are always updated. Available in an annual or monthly subscription. Your subscription will continue until cancelled. Get the latest premium versions of Word, Excel, PowerPoint, OneNote, Outlook, Access and Publisher with instant access to new features every month. Stay in touch with your friends and family around the globe with 60 minutes per month of Skype calling to mobile phones and landlines. As an Office 365 subscriber, you can get help right away from Microsoft trained experts, by phone or chat – at no extra charge. Learn more about Office 2019.